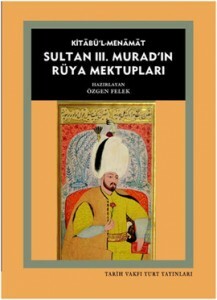 In 2007, Ozgen Felek, now director of The Sultan’s Dreams Project, was collecting Ottoman manuscripts dealing with dreams and dream interpretation, when she came across an unusual manuscript, which would turn out to be the collected dreams of Sultan Murad III (r. 1574-1595). She soon realized that this collection of nearly 2,000 letters was a unique and precious resource for understanding the thoughts and psychology of an Ottoman ruler. Her University of Michigan dissertation, “(Re)creating Image and Identity: Dreams and Visions as a Means of the Self-fashioning of Sultan Murad III” was based on this manuscript, and she later published a transcribed edition of the text. Beginning in 2013, with the assistance of Prof. Walter G. Andrews of the University of Washington, she also began translating the dreams into English. In 2013-14, Dr. Felek decided to create an on-line portal to information about the Sultan’s Book of Dreams and its context by becoming a collaborating partner in the Newbook Digital Texts Project located at the University of Washington. The goal of this collaboration is to create a dynamic and growing website that will present the history behind the text of Sultan Murad III’s Dream Book, including English translations of the first 100 dreams, freely available to both scholarly and general audiences.